A big thanks to Ben a Foilsport for setting me up with this beauty. I have been foiling for 2 years and have ridden a range of different brands. Previous to this I was on the Moses 590 on the 91 mast. And be attched to a prone surfboard. I believe the 683 is that wing. Yet to attach it to a surfboard but all other boxes have been ticked. Compared to the 590, the 683 is smoother on breaches, very early lift, similar top speed and feels much smoother on the water and turns on the dial. Hi mate, can you tell me what the fuselage is made from? Its Aluminium, really nicely finished. Seems strange to go to all that effort to design a foil that gets rave reviews for performance and then not go full carbon. In case you're chatting with the company people, let them know that aluminium is a deal-breaker for some potential customers. No offence meant, just sincere feedback. Yep heard this before from you. Please come check it out for yourself. You can grab any model from me and go for a ride and check out all the parts. I would love to hear your thoughts after taking one for a spin. 3 years now as Moses Australia dealer and not a single problem with this fuselage. And have asked this of Moses before (shared your concerns) and world wide this is still the best way to go. There is an argument with the race foil market for sure due only to the weight. No corrosion even when not cared for properly. No problems with fastenings which is really tricky with carbon. No breakages with grounding and jumping. These foils are meant for doing airs as well. Cheaper than carbon as well which is good when as you know its an expensive foil already. Hey mate as mentioned the quality is next level. I find the combination works really well and weight is definitely not an issue. Thanks for info, and sorry for repetition - I wasn't sure if it was the same fuse for 683 as 633. Will see about a demo and a closer look at construction when I get some time, thanks for the offer. Yep cheers please do have a go of the foil. Thinking more about it, and from my experience with manufacturing foils its the connections / fastenings that are the real big problem. For example I cant think of a high end foil that has the carbon fuse that does not have the wings attached. Moses is very keen on being able to change wings and pack down ect ect ect so i think thats the biggest reason. Despite aluminium fuselage this foil floats on the side which makes it super easy to start strapless. If the board is pointing the right way I don't need to touch it with my hands to water start strapless. Weight is definitely not a problem. Not seen any corrosion issues yet. I remove wings and lubricate screws once a month maybe - no sign of screws seizing after few months. Manufacturer recommendation to pull apart and wash in fresh water after every session sounds like an overkill so far. Have to agree mate. Had my first strapless session on the weekend. On up on the foil with one strike of the kite. It's so stable under feet, love how is floats on bay waves. I am very interested in the 683 but not an advanced foiler. I hope to demo one soon however in the meantime keen on others experience. In particular down wind control riding 683 as I have found some smaller wings difficult. 683 is not a small wing but with comments it's for advanced riders it gives me some concerns. You could easily learn to foil on the 683. If I started on that wing I would have the whole switching feet thing mastered. Don't be frightened by those reviews. Very user friendly foil. This is the most forgiving foil for breach as with the 61cm mast I spent a lot of time with wings on the surface. From today in summary; super smooth, excellent upwind, good down wind, very carvy, light to carry best wing I've used todate considering conditions. I am in my second foiling summer and own/demoed about 8 foils. Is it worth the extra $? I hope to have more time on the water in the next few days so will comment further. Good to hear. I'm on the 91mast, perfect size. A little bit off topic for the wing being discussed but may be helpful. 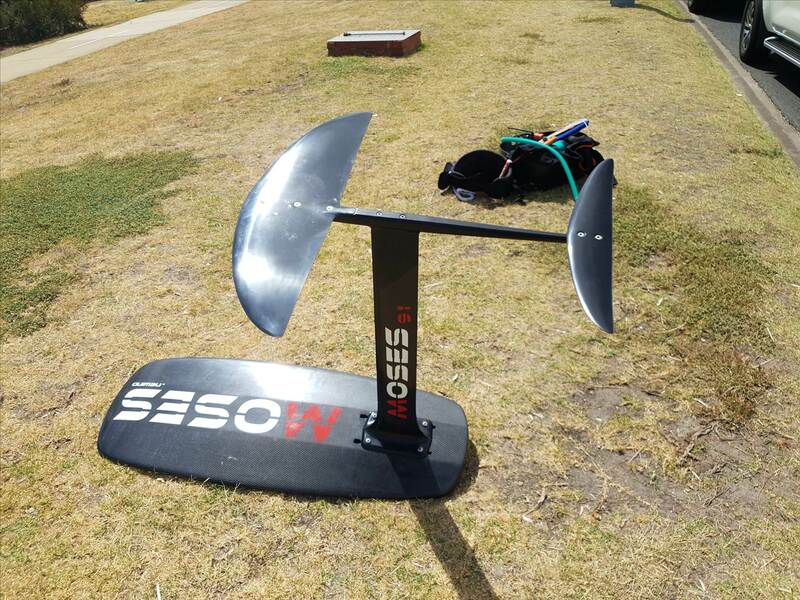 I've been using the Moses 633 wing on 91cm mast for a while which has been great. 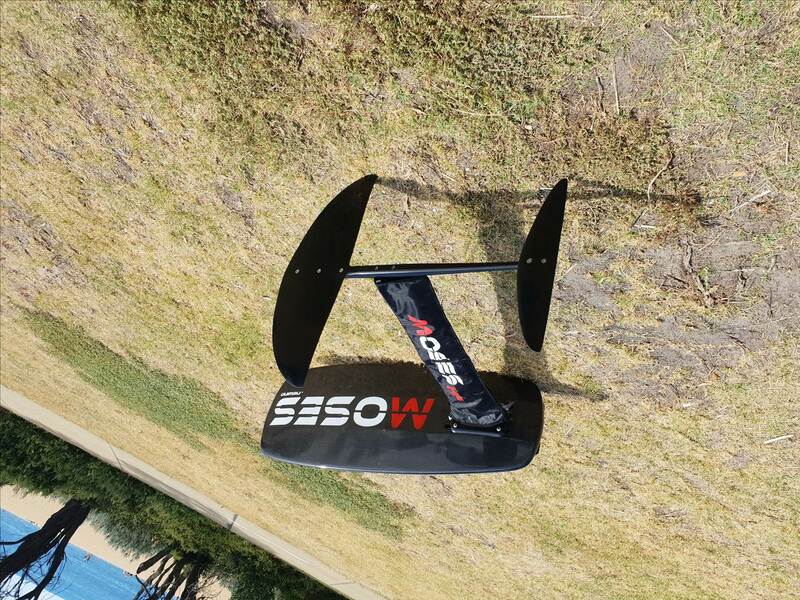 However in strong winds over 20 knots with a 5m LEI kite I found the lift from the front wing getting the better of me. Especially when surfing down some wind swell it could breach even if i piled on the front foot pressure. I figured that I wasn't comfortably getting the speed others have claimed on this wing. After a bit of reading I saw that some have shimmed the stabiliser to get a bit more control at speed. Considering I'm 65kg and the foil is probably set up for the average 75kg rider, I made up a tapered shim for the stabiliser of approx. 2? and gave it a go in a decent blow. Instant difference. Easy to control pitch at speed, even when out of control in a gust coming down the front of a decent wind swell. Feels a bit faster as well as well as more controlled. Definitely worth having a play with your stabiliser if you feel you should be getting more out of your kit. Today wind from nothing to 7 to 10kn max short sessions. 683 is in my experience super efficient as in at the very best 10kn gusts on 8m strutless kite reaching 16kn speeds struggling to get 17k distance. Tomorrow I'll go back on my Naish medium for a recheck for comparison. I had a full carbon foil (not a Moses) with the main wing being secured with 3 bolts. After about a year of riding it and clipping the wing tips multiple times the fuselage split along the fuselage along the line of the bolts. I opened it up and found that it was made from mostly unidirectional carbon (to make is stiff) and so this meant much less strength perpendicular to the fibres. I asked around and found that a few of production houses had moved away from carbon fuselages for exactly this reason. I don't know if this is the reason that Moses use aluminium but it was one of the key reasons I switched to a Moses foil. Brand of the split fuse? I have no problem with naming brands whose products are inadequately engineered. Though it's another question regarding how many times should you be able to "clip" the wing and expect a product to hold up ...? Well designed and constructed carbon will always be stronger and lighter than aluminium, but crappy composite work will always have weak points. The liquid force impulse and rocket wings are the worst composite work I've ever seen in a kiting product. And then there are the companies that speak of their magic "carbon compound" and whatever the f that is it's not carbon fibre, just some crappy injection mouldable paste that will inevitably crack. CNCing from an aluminium billet is a very low-res solution. I'd pay for a properly crafted carbon fuse, just as I'd pay for a properly crafted carbon mast, and I'd expect the stainless steel inserts in the fuse to be as strong and problem-free as the inserts in the bottom of the mast. Naish medium is a very good foil once graphics are all wet and dry 1200 grit smooth sanded. However now having foiled the Moses 683 Naish is not as smooth. Yesterday's conditions and today's were similar ie less than 10k wind speed using 10.4 strutless kite. Results from my GPS watch were close with 683 very slightly faster. 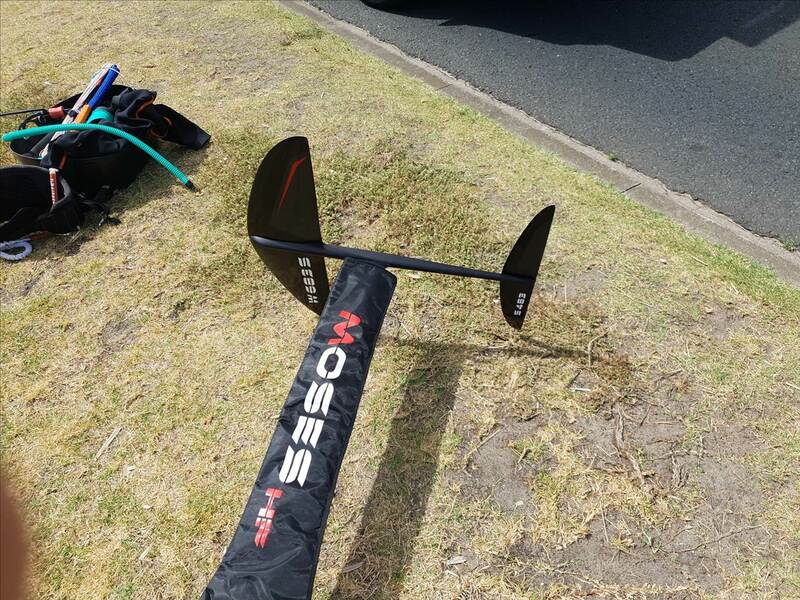 So in summary I feel for my ability I have reached the best I'll get out of the Naish and feel the 683 Moses being faster in acceleration, smoothness and playfulness will help me progress. Note: my demo on the 683 was on a 60cm mast so harder to push for speed . Naish is on 70cm mast. I will keep my Naish and may (most likely) get the 683. How are you going with the transitions? Same as on the Naish ie good to toe side and back plus touch downs to switch feet in both directions. 70cm mast on Naish however 61cm on 683. I agree and have used 91 and longer masts so know what you mean. However 71 suits where I mostly foil. Well I am close to buying but the price is significant. Then to top it off it seems wing and mast covers are an extra cost. How bizarre when most if not all lower priced foils have covers and more. Not sue I'll get over this hurdle. Call ben from foilsport he will sort you out. Sold some gear so 683 now funded and ordered.